I like to travel. I like to travel with my husband and with friends. But, there is something special about going it alone. Last week I had Thursday and Friday off. Thursday I spent catching up on work, cleaning the house, and doing odds and ends. Friday, though, I wanted to do something fun. At first my only cristerion was to do something I’d never done before. I thought this might mean that I would end up wandering around San Francisco going to a neglected museum, lunch at a new spot, or a new neighborhood to explore. Then I got to thinking, another trip to the city wasn’t really what I was after, I wanted to stay off to be an adventure, I wanted to be outdoors. In the back of my head I thought, well I could drive to Yosemite. 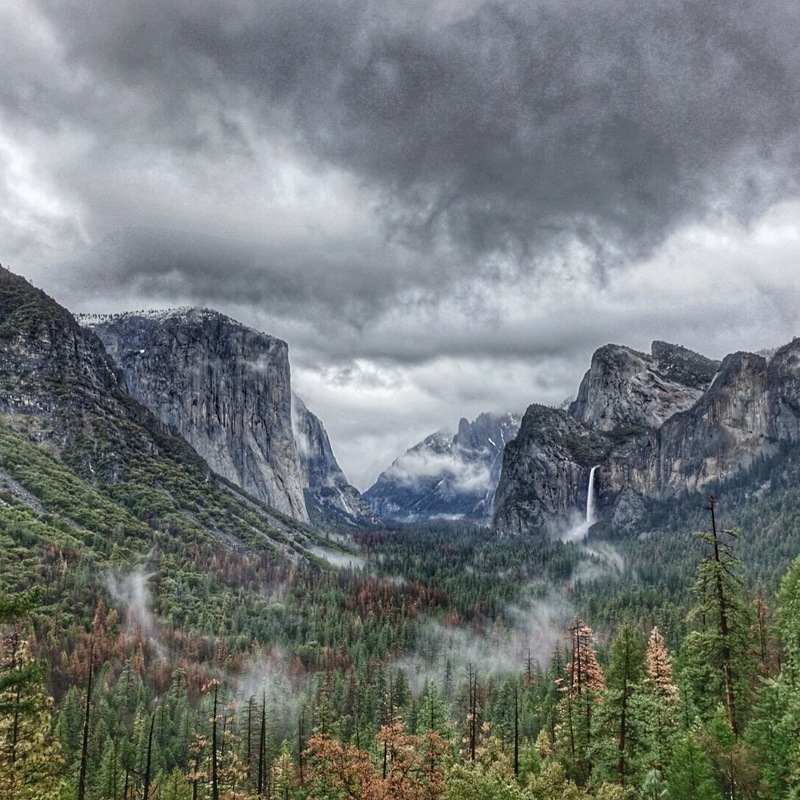 Yosemite is a drive just under four hours from my house. The weather was not predicted to be great. It had rained pretty ferociously the night before, and was forecast to continue sporadically the next day. This meant perhaps snow in Yosemite. I don’t typically drive in snow,and don’t really have any practice doing it, so to it a little scary for me. Even in morning after I woke up, I was still weight the options of SF or Yosemite. I ultimately decide to go with the adventure. I threw my hiking shoes, some hats, and coats in the car and started out. I told myself that I would keep going as long as the weather allowed. If it seemed at any point that I might run into snow or somehow get stuck, I would turn around. I made the turn off to the final highway approach to Yosemite, hwy 140, feeling good. There had only been a few drops of rain my my windshield for the past 2+ hours. I was now committing to go the rest of the way. After winding through valley and up and then down, I finally reached the entrance to the Park. I got to the little hut where I paid my entrance fee, got my park map, and was so proud of myslef that I had followed through on my plan and was here by myself, I wanted to gleefully say to the ranger, ” Hi, did you know I’m here by myself. Isn’t that exciting? !” I have a feeling though, that my enthusiasm would be lost on him and I would get some kind of response like “that’s nice ma’am, have a good time and be careful”. Well, if he wouldn’t share in my moment, I would just soldier on. The first thing I did was pull off to the nearest parking lot. I immediately got my camera I started taking pictures I did this in part because it was beautiful, and it was photo-worthy, But, I also think somewhere in the back my mind part of me was thinking, what if this is as far as I get what this is all I have to show for my trip to Yosemite. What if I don’t get tot he valley, I better take some pictures now, what if I get lost, what if I can’t keep going? Snap, snap, Click, click, click went the shutter. But I drove on, with the idea still in my mind of doing something I’d never done before. I wanted to see Yosemite from a new vantage point. I headed up to the Tunnel View overlook. All the way there, a few miles I was absolutely awed by the ace early around me. This was not my first trip to Yosemite, but its beauty was stunning. With my mouth already hanging open, I reached the Tunnel view vista, parked my car and raced to join the others peering into the valley. I snapped this shot of the valley amid all the other onlookers with tripods and speak myriad languages. 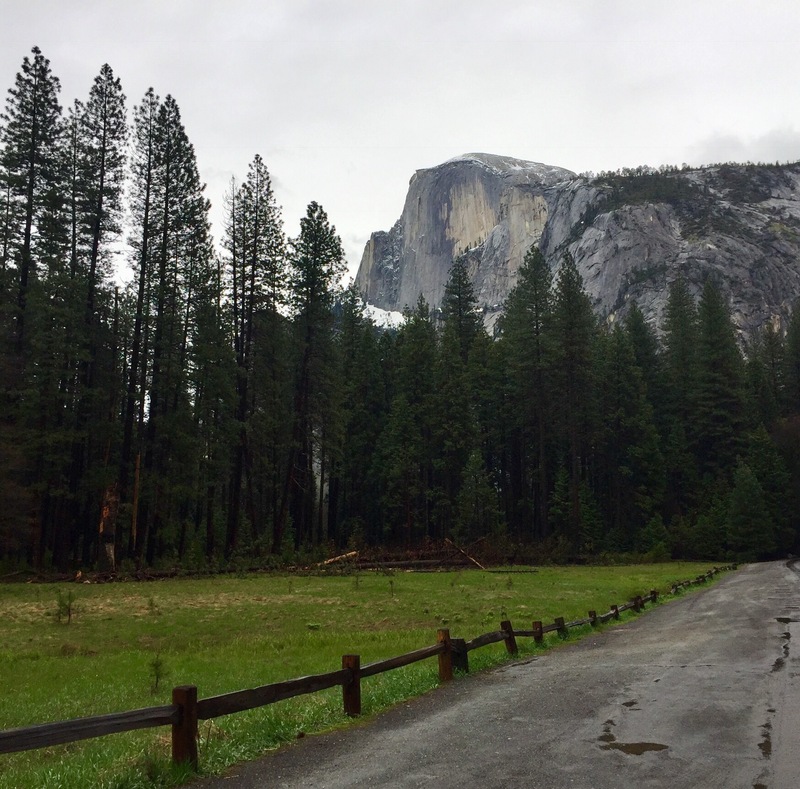 It was a reminder that though it is relatively close to home for me Yosemite is a destination for people all the world, and here I was doing it on my own. I took my surge of energy, and moved on. 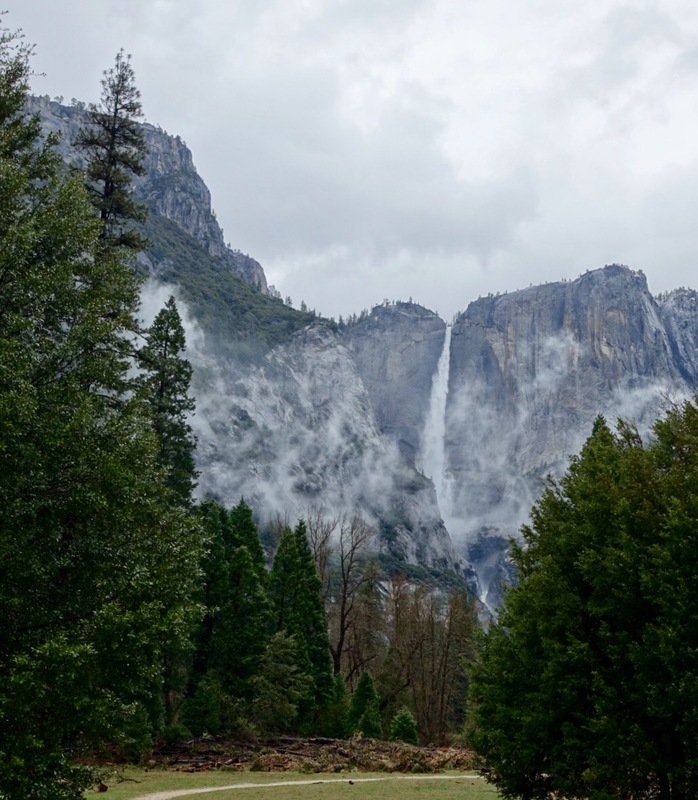 My next stop was Bridalveil Falls -from the distant view to a close up view. Even from the parking lot, the was a great view of the massive falls, and of course you could hear the water as it pounded the rocks below. It started in the short trail trek to the falls. It’s been a wet winter – the wettest on record actually, so the trail in front of the falls had turned into a massive puddle. I attempted to make my way to the front for a better view, I ended up not with a great photo, but wet shoes and socks. Whoops. Of course, I wanted a picture of myself among all this beauty. I don’t and won’t own a selfie-stick. So, I am reliant on the kindness of others to get a picture of myself in various places. Sometimes when one travels alone, one can get wrapped up in being alone and that works. It provides time to recharge batteries and return to civilized society ready to deal with other people Other times, communicating with other can bring benefits like finding out about new places or the people themselves. In this case, as I was wandering awed by the falls, I asked someone to take my picture. This stranger suggested I pose like this. I apparently, wanting to embrace the whole park, complied. 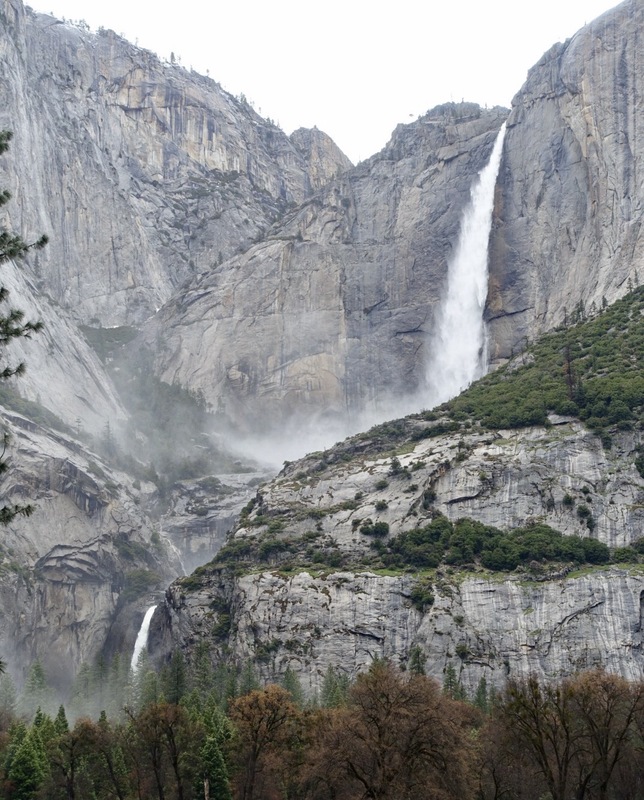 As I continued to move through the valley I was stopped in my tracked by Yosemite Falls. 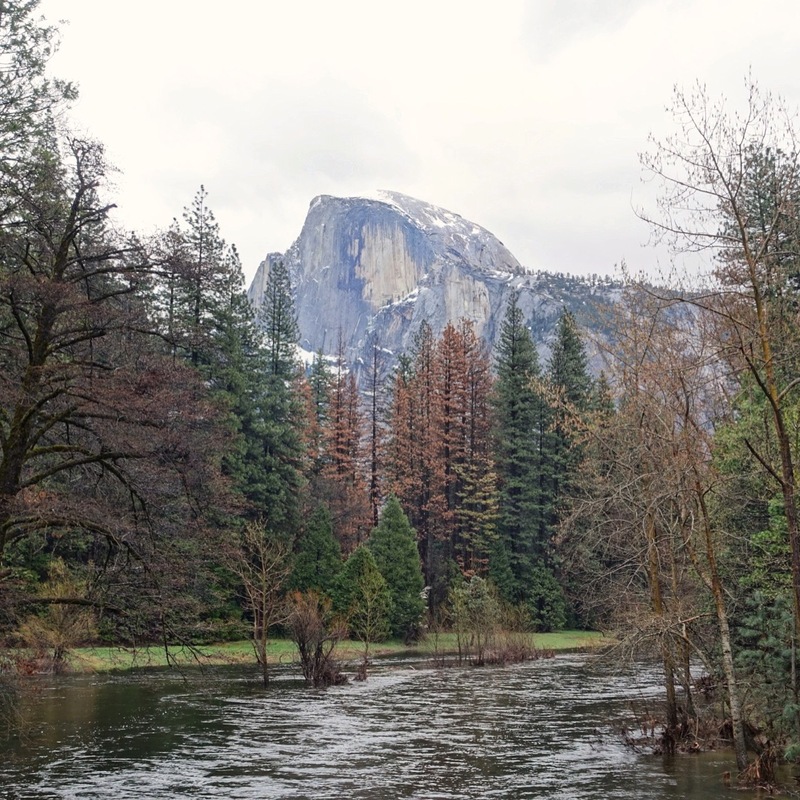 Just past the falls I snapped this image of Half Dome from a bridge, perfectly framed by trees and the river. Thanks for your comment. A Milky Way siting in Yosemite sounds awesome. Definitely worth the trip I would imagine.